Thanks for sharing the photos of your condo. I suspected it would be heavily damaged. Were you on the island during Maria? I hope not. Sorry about the losses. I attached a photo I took this morning from our window. Come visit us any time you long for the mountains. Thank you for sending me a photo from your window and for the invitation. I have learned about you from the Trend Following book. I have been trading on my own full-time last three years and had some successes, but mostly struggles. I am willing to give it all it takes to succeed. Please, is there a way I could join your Tribe. I really would like to be part of your community. Thank you. Thank you for expressing interest in joining the Tribe. You might consider beginning by reading through FAQ. Just reaching out to say hi. I wonder about the damage to where you live post Cyclone Irma? For readers of FAQ I follow the FAQ and the TTP process for a few years now, including Tribe work and a Workshop (2014). Thank you for your posts especially the ones with photos, they always get a rise out of me. Our Tribe disbands a few years ago after we unanimously decide to go and do other things. Friendships remain in person and through other platforms. I continue the work on myself exploring other fields including the work of Robert Moore and the late James Hillman. I mention this because it might prove interesting for yourself or others. So three years on from the 2014 workshop, my relationship skills improve to a point where I can form and join effective teams. I now live in a new city near the beach, have a great group of friends, work in a modeling role (financial - my looks wouldn't allow any other style) working with owner managers earning good money. I play in a band, producing average sounds but lots of fun. I have built a long term equity portfolio system that publishes results on a website. Improving my coding skills and subsequently the system will continue incrementally. I feel ok about splitting my time between various projects, it just works for me. You know, I find myself reading FAQ posts/replies from time to time and I it surprises me how often one your posts resonates with what I have going on in my life. The Two Lovers article in (Sep 24, 2017), hits a chord. So last Friday I go on a first date. We meet and enjoy drinks over good food and good conversation. We chat for ages and call it a night, going home separately. In the morning I wake up with a full heart. Saturday I meet with a group of mates at a street festival. One of my mates announces her pregnancy to her husband. We celebrate with beer, like most from my country do. Later that afternoon, the girl from Friday night pops down to say hi. At this point, consider me drunk. My mates, her and I continue to drink at the festival and she leaves after an hour or so. Sunday she messages me and says that she had the best time on Friday night but she no longer feels the same, which I assume relates to seeing me drunk. I feel disproportionately sad given the time we spent together, to the point where I share this with you and the wider FAQ community! I thank her for her honesty and tell her I feel really bummed about this and I would have liked to get to know her. Respecting her decision I reluctantly wish her well. She seems happy with my response. In that moment and to a lesser extent now I feel sad, it still hurts. A week passes and I share this story with my mates, the FAQ community, double down on work projects and surf a few times. In some ways this little snippet of my life clarifies what I would like, and losing the person that holds the image of the mate I want just hurts. On a deeper level I wonder what causes me to drink in the first place?? Historically I enjoy engaging in high risk behaviours, although less lately. Just wondering about your thoughts on pivoting from a Dopamine to a Serotonin response pattern? Thank you for sharing your process, for acknowledging the work - and for raising the alcohol issue. Various approaches alcohol addiction have about a 5% success rate, including AA, doing nothing, receiving a stern talk, force of will and so forth. TTP, anecdotally, has a higher success rate for deep behavioral change, although I have no hard data specific to alcohol and drug addiction. In TTP, we hold that medicinal behavior has the positive intention of covering up feelings we don't wish to experience. When we re-frame our feelings as allies, we lose the desire to cover them up with medicinal behavior. Some people use dopamine-centric, addictive substances as medication for deeper issues. In this case, we have two layers to treat. We have the original underlying k-not (behavior - feeling - judgment snarl). We also have a dopamine-craving drug-withdrawal syndrome. The TTP approach runs along these lines. 1. Test the client for willingness - and keep testing him throughout the process. If he loses willingness, terminate the process. 2. The client agrees to stop using. So no more drugs or alcohol. Failure to stay clean terminates the process. 3. When feelings come up, take them to Tribe as entry points. 4. Disorganize the judgment of feelings and behavior through relentless validation and the healing field of acknowledgment. 5. At first, feelings may mostly have to do with the dopamine-withdrawal layer. 6. Eventually, as other feelings surface, implement the Rocks Process to alter basic response patterns from medicinal to pro-active. 7. To solidify the gains, locate and implement right livelihood - perhaps including sponsoring others who wish to traverse this path. Thank you for sending me the link. I wonder how you feel about it. I hope life is going well for you in this moment - your friends are safe and the windows are in process of repair in PR. I am thinking fondly of you today and a Gaelic tune with drumming comes to heart. Thank you for thinking of me and for sending me the link. I have fallen into the same cycle as when I contact you several years ago. My soul is in a trap. I go through memories of when I was young about 2-3 years old being trapped and held by my maids. Recently the same maids that did that to me when I was younger appears back into my life. When she came over my body felt like it wants to spasm and kick around. I wonder what you are up to? I wonder if I will get to see you again. You might consider taking your feelings about <trapped> and <held> to Tribe as entry points. You may send the maids to me for further processing. I've checked both the ESeykota & Seykota sites & they are stuck on Thursday 10/26. I was also wondering if you'd consider having a list of the strong and weak stocks on your site in addition to the pictures. I only ask because all of my attempts to automate retrieving your information are less than perfect, i.e. the OCR programs don't handle the information well. Thank you for reporting the situation. TT Chartbook runs on a laptop, automatically and on a timer. If a power or Internet outage occurs during a critical step, the charts do not post correctly for that day. This behavior may continue until I replace the timer with a sequencer that verifies completion each step before proceeding to the next. I post the stock charts only as examples of trends - not as any type of recommendation to buy, sell, hold or stay out of any particular instruments. I do not contemplate people downloading lists of stocks from my site for further processing or trading purposes. I have admired you since when I first read market wizards a few years ago. A gift from a veteran trader. Ever since I have bought and read both of your books on your website. I have since committed to becoming a real trader. Focusing totally on the process. This year finally I was given a position at my firm where I can develop systems for trading mostly on equities market. It has been a difficult task, one I am committed to achieving and focusing totally on the process of development of both the strategies and myself. It has been a rewarding time. I would like to thank you for all you have created and for being an inspiration to me and others worldwide. I am a member of Brazilian Trading Tribe also! Thank you for requesting a Workshop. I plan to host one in Austin sometime during the Spring of 2018. To order the Essentials Card, see Resources, above. I benefit greatly from your books, FAQ, Risk Management and Chartbook. My whole family loves the Whipsaw Song! I write to you to ask for feedback on my professional development. First some background. I recall over 2 years ago being abruptly fired from my middle management corporate job (of 17yrs) in a Dow company. I experience depression and complete lack of energy in my entire body for 3 days. Then I start to allow myself to feel the pain of losing the only work family I have known. I cry in 1:1 meetings and share my feelings about parting with my co-workers. This confuses my co-workers who have never seen me so open and vulnerable and they are very supportive. Most important, it helps me move forward. I close out on that part of my life as well as possible, doing more training than asked because I want my employees to experience great success. I still sigh thinking about this loss but I realize now that the ending of this part of my life was a gift. During that old corporate life and especially after feeling the confusion and fear in the tech bust of early 00s, my primary hobby becomes trading. At first I want to figure out the “why” to medicate my fear, but then I stumble across Covel’s Trend Following book, your work, etc and I begin to understand that following the trend is more productive. In the last 15 years I read >200 trading books and use my excel finance background to help model and trade many different systems I find or develop through my growing understanding. I read about everything I can find which seems to hold good bliss potential and then run small excel tests on the most promising. I avoid the hucksters that show high returns and hide drawdowns and the hucksters that show back tested data without actual trading (unfortunately most info out there is junk and seems to fall into one of these 2 categories). Through this slow study I educate myself to the point where my returns/risk is at parity or slightly better than recent stock market performance when fired. Currently I have 17 systems and 2 “setups”. Without going into details the names of the systems are: Global ETF, MOMO ATH stocks, VX, Bitcoin, Alt Coin, LT Bond Futures, Tropical Futures, Metal Futures, Nat Gas Futures, Nat Gas Curve, Crude Curve, Wheat Curve, Lumber Curve, Coal Stocks, POT (stock), RYN (stock), Seasonal Futures. All systems are trend following with the possible exception of the last, Seasonal Futures, which could be considered trend following if looked at based on prior seasons or trend reversal if looked at over the course of the current year. The 2 setups are trend reversals only to be traded in very specific post-crash conditions by purchasing options with small % risk: Stock Reverse, Bond Reverse. However even these post crash systems could be thought of as “short-term trend following” instead of reversals. One asset that is absent is FX. Though I have tried many times I have been unable to fit in any FX systems because of the high correlation to existing futures return and the lower bliss function I generate in my FX systems. This doesn’t feel right and I keep coming back to it. I design my systems to stay out of the market as much as possible. I measure the market or sub market for trends as a filter for many of the systems. As a result there is no time when they are all “on”. Right now 10 systems have active trades (some with multiple positions like MOMO ATH and Seasonal Futures) which is fairly typical. Most systems have risk stops as % of portfolio values, some systems use time stops, volatility stops and other stops as well. I have position sizing in some of the systems which factor positions by up to 10x from initial purchase. Other systems maintain constant position size. I choose all these system characteristics by trial and error in Excel optimizing for total system bliss. Using Excel has many advantages for me: I have >20yrs experience in it so I can “think” spreadsheet, and it allows a great deal of flexibility in what can be measured. But in designing each system individually using Excel (using individual spreadsheets for each system because of size/memory constraints) I feel limited because I am optimizing that individual system without much knowledge about how it will impact the larger system until I fit it in at the end (very time consuming). A friend tells me I should learn a program like Python and do my research and back testing in Python. I think he is right but I am not sure how important this is and how I should prioritize this. My goal is to develop myself and my trading to achieve the highest return possible for 25% or lower drawdown over 6 months or less time. While I have had offers of money management arrangements from family and friends I have no plans to manage other’s money or commercialize my trading for 3 reasons: I enjoy the flexibility of my time, I am sensitive to the fears of others, and do not enjoy the sales cycle. This year my trading accounts are up 58% with 17% max drawdown. I’m pleased with this result but I see a lot of room for improvement also as this year has had great trends in crypto currencies that my system has taken advantage of for much of the return. While not all of the subsystems I currently have were in place; in 2016 I experience 4% return and in 2015 25% return. However both of those years had larger drawdowns. Also I back test out of sample 1990s data (using as many systems as possible/practical – bitcoin for example could not be replicated and MOMO ATH stocks in Excel is too time consuming). This back test on ~70% of systems generates >50% returns and 20% max drawdown. This is in line with what I expect because while my in sample system back test yields >100% CAGR and 15% drawdown, the drawdown is low because optimizing systems by its nature creates curve-fitting and the CAGR is high due to the incredible rise of crypto currencies. The net result is that I’m getting good actual returns that are coming close to my out of sample testing. Maybe this is the time for me to learn a programming language. I feel a tightness in my neck as I think about learning a language. And I know that by continuing to pursue system optimizations in Excel and possibly add new negatively correlated systems I will definitely be able to improve, but the programming language value is an unknown. Can you please advise me on where I might see the most benefit? Should I focus more on learning a programming language like Python or continue to work with what I know in Excel and make incremental improvements? Will the language knowledge possibly allow for breakthrough thinking/understanding of how my systems operate that I won’t be able to get staying with Excel? Thank you for sharing your work which continues to contribute greatly to my development. Thank you also for your time and consideration of my question on where to direct my effort. Thank you for sharing your process and the workings of your system. I hold that a trading system has a math part - that includes your formulas and automation - and a personal part that includes your portfolio selection, heat settings and willingness to follow your system. Per the math part, I gather you like to collect and develop systems - and you like to to conduct your testing in Excel due to discomfort learning another language. Languages such as C# and Python offer advantages in conducting parameter optimization studies over multiple systems each with multiple instruments. Bliss normally means CAGR / Draw_Down and has units of measure of (%/year)/(%) = year-1 and tells you the draw-down earn-back frequency. For example a Bliss of .5 indicates you earn back half of your drawdown per year. A Bliss of 2 indicates you earn back your drawdown twice per year. Your formulation for Bliss has units of measure of year-2 and seem to indicate the frequency of the frequency of earn back. I do not know how to interpret this metric. As you point out, you get most of your returns from your crypto positions and that brings us to portfolio selection, heat and willingness - your personal characteristics. I might guess that one very-simple moving-average system trading crypto instruments does as well in your back tests as all of your other systems in combination. You might consider recalling your process for including crypto currencies in your portfolio - and make sure to repeat this process when the next monster trade happens by. If you wish to continue with the rest of the math-turbation, you might like to master a standard computation language such as C# or Python. You might consider taking your feelings about <learning a new language>, <finding the perfect system> and <letting go of relationships> to Tribe as entry points. - I combines snippet of John Ehlers works, your philosophy, and various others to come up with some sort of break-out bands. - Model trades 6A,6B,6C,6E,6J,6M,6N,6S,GF,HE, KE,LBS,LE,NG,PA,RB,SI,VX,YM,ZM . - All cafeterias are exactly same as the previous model's except on this one the bands are little wider from each other. As a result, model sticks with trends longer than the the previous. Thank you for sharing your system ideas. I cannot, from your general description, tell much about how your system works. In particular, I do not see how you set your stops or determine your position sizes. Your results show annual return of 23.55% and maximum drawdown of 6.31%. That gives you a MAR of around 3.73 over the last 10 years. If you pitch your system at a 25% draw down, you then get an annual return of 93%. If you compound that for ten years, you get a gain of around 70,000 %. That seems, to me, a bit optimistic in actual futures trading practice - in which we currently have fund managers proudly showing off break-even performance. You might consider re-running your back tests to show sensitivity to your parameter values, especially execution slippage. You might also consider making up charts for your 10 best trades, including the ones that get you the bulk of your 184.04% gain in 2008. From 2011 through summer 2014, the U.S. Dollar was a trend follower’s nightmare — reversal down, reversal up then a sideways mess. After an extended period of range bound price action and declining volatility, long-term trend following systems signal to buy in August 2014 when prices start appreciating higher. By this time, trend followers likely had enough of the U.S. Dollar and were reluctant to take the next signal. Some traders likely extrapolated the past and saw yet another false breakout and expected to take yet another small loss when prices inevitably reversed. Not taking the August 2014 buy signal would’ve resulted in a major missed opportunity. The U.S. Dollar rallied ~20% over the following seven months. Trend followers, who took the buy signal, made lots of money from this trend. One of the worst markets became one of the best. When a breakout occurs, no one knows if prices will persist further or reverse. I could not have imagined this trend when my system told me to buy. I simply followed my rules — bought into the upward trend and stuck with it as it continued trending higher. Without the discipline to take the next trade after a string of losses, those gains don’t happen. Lately, many markets remind me of the 2011–2014 U.S. Dollar — not really going up or down but oscillating in a sideways manner. Many currencies, precious metals, energies, bonds and agriculture markets have behaving similarly. The past few years have been particularly frustrating and annoying. But I believe we’re at a point again where trend following traders and investors are feeling doubt about whether to take the next trade and stick with the system. The risk of quitting during drawdowns is that you do not benefit from the next round of positive performance when trends come back. The risk of not getting back in exists in all investments. Many investors are still living with the frustration of not getting back into the stock market when the trend reversed in 2009–2010. Those who quit on trend following now, I believe, will likely experience a similar frustration. I assure my investors that I intend to benefit from the next round of trends — whenever they occur. The way I plan to do this is by sticking with my system; nothing but old fashioned discipline. Thank you for sharing your process and your resolve. I feel out of place and overwhelmed. I tell her that, if she wants, maybe I might be helpful during the process. She agrees and wants it. I then just accept her and enjoy her feeling and doing whatever she wants. It is a Tribe meeting of two. I consider that she experiences a „very intense sensation, part of life and of the delivery process“ and not something that I have to influence or, as a doctor, supress. She immediately and completely relaxes. Afterwards, she mentions that <strenous pain> turned instantaneously into a <a sensation, very intense but not unpleasant“. The process gives me the opportunity to observe myself trying to fix her (I want her to feel better) and to control the outcome (I think of it as a medical intervention that could be useful for other pregnant women…). I also can accept my own need for fixing people. Then a nurse enters the room and asks her „is the pain still bearable? Do you need any drugs“. She starts feeling „unbearable pain“ again and requires a anaesthetic drug. The next morning she thanks me for my support and tells me „I could not have done it without you“. I just accept it, thank her and love her. I want to share the attached picture with you, my dear friend, but kindly ask you not to post it on FAQ, since I don´t know if my daughter would agree, and I don’t own her. Four children and counting 😲 (this is bragging, of course, an attempt to control you 😊). I hope you do not mind me reaching out to you, but I am currently at a crossroads in my trading career. I committed myself fully to trading futures in 2016 and learned a great deal by reading several books and by getting many hours of screen time and trading a real account. I managed to get to 4th place on the futures trading championship in August, but ever since, I made mistake after mistake which dwindled my account down to -60% of it's initial value. I would love to meet you in person and if possible have you mentor me. I am willing to travel to Austin, Texas in order to do so. I notice the contest ranks traders according to net return - and does not take volatility or drawdowns into account. As such it tends to reward reckless trading - the kind that may account for your subsequent results. You can get a free mentorship, of sorts, by sending your concerns and process to this site. You may also start or join a Tribe. You may also apply for private consulting (See Ground Rules, above). I give special discounts (like 100%) to skillful musicians who show up at my place in Austin with acoustic instruments. Total apt.destruction.very sorry.I was safe where I live on escorial,behind the shooping center.but was lucky because some apartments has broken windows and get ruined too (but not as bad as yours).thank you very much for the pics.I hope to meet you some day. Thank you for extending your empathy. I ran into an interesting thing while doing research and was hoping to get your thoughts. I hope all is well. This issue arose from turning a back tested one lot equity curve into a AUM equity curve (details below). The reason I was converting the one lot to a percentage was to make it easier to build a portfolio. Taking weighted percentages of individual percentage returns for each market is easier than building one giant model. I tested the math between the two approaches (i.e. % of % or big model), it is identical. Multiply daily one lot equity curve times contract count and build AUM equity curve accordingly. How in the world did the one lot curve turn into the AUM curve? It comes down to shifts in AUM and underlying commodity price/contract value which ultimately lead to shifts in contract count and P&L. 2. On 1/3/2011, notice 10dayAUM is negative while 10day1lot is positive, how can that be. 3. The blue highlighted area shows how the system went from 17 contracts on 12/29/2000 to 4 contracts on 1/2/01 (assumed monthly rebalances). A combination of extreme price changes and AUM losses resulted in the large position change. 4. Notice on 1/2/01 the one lot made $10k but, since the AUM approach went to 4 contracts versus 17 the day before, it only made $40k not $170k. This $130k difference (and the difference on 1/3/2001) is the reason the one lot and AUM 10 day outcomes varied (and why the equity curves are so different). One lot back testing does not necessarily work for multi lot use. Changes in AUM and contract value can result in changes like those outlined above. It seems this is rare (most markets don’t move as much as nat gas) but the potential for this issue remains. Scrap one lot testing in favor of more realistic multi lot testing. However, I am concerned this would effectively just be curve fitting for AUM/price changes. Also, multi lot code requires a loop and runs magnitudes slower than one lot code. Use a fixed number of contracts (i.e. ten lot per $1mm). Problem here is this totally ignores the value of the contract. If the price triples and you keep the ten lot constant the market exposure has tripled creating more leverage. Build a system that allocates/sizes based on risk. This seems the most viable but I’m not sure how to proceed. My general thoughts are it would be best to add in stop losses and assign a certain amount of risk (i.e. 1% of the portfolio) then size accordingly. Was hoping to get your thoughts. You might consider keeping your simulation models in the moment of now. For example, every morning, your model can survey equity and positions and stop levels, and then set the orders for the day. During the day it can award fills (with some slippage) and then adjusts position sizes. With this protocol, you cannot simulate individual market results and then combine them later. Nor can you implement other conveniences like simply making 17 contracts re-balance to 4 contracts over a month-end; your system has to enter portfolio balancing orders, like other orders, before the market opens and then harvest the trades during the day. If you follow a strict in-the-now protocol, you wind up with something consistent and realistic. You might consider taking your feelings about <staying in the moment of now> and <doing it right> to Tribe as entry points. Can I use it in the foreign exchange market? Feel the foreign exchange market does not have the kind of long-term sustainability of the stock trend. The foreign exchange market is more frequent shocks. Exponential Average Crossover does not seem to have any advantage? Yes, you can use apply indicator to every market. You can determine, historically, how various indicators perform in different markets by back testing. In the long term, all currencies make their way to zero via inflation. Stocks do so through managerial calcification. Let me know if you find a piece of paper currency or a stock certificate, with an issue date before 1800, that still has a value - other than as a collector's item. On this auspicious festival of lights, may the glow of joy, prosperity and happiness illuminate your life. Thank you for sending me your beneficial wishes. Greetings from Toowoomba, Australia. I just wanted to express my gratitude to you for the wonderful service you provide with the FAQ. I have gained a tremendous amount of knowledge reading through the questions and your insightful answers. Helping people the way you have is an amazing legacy you will leave to the world. Thank you for sharing your process and for acknowledging me and the work. I have been a long time fan of yours and just recently read that you worked at Commodities Corporation, is that true? I would love to have chat with you sometime if you are available. I recall briefly consulting with CC many years ago - and learning, first hand, how corporate culture and office politics can influence trader performance. I can chat through this site, through private consulting (See Ground Rules, above) and also if you happen to drop by my place in Austin with an acoustic musical instrument and tunes to share. I am so sorry to see the damage to your place in PR and glad that you were safely out of there. I can probably relate to your experience more than most. In 2004 two hurricanes, Francis and Jean, hit my oceanfront home about two weeks apart. and once the envelope was compromised the hurricanes did tremendous damage. Afterwards the biggest problem we had was finding qualified professionals to work on the house. It took about a year before we could get truly qualified builders to even give an estimate for repairs. I hope that either you or your condo association have a way to get the repairs done quickly. In the meantime, I trust you are enjoying Austin. Thank you for reaching out to me and sharing your experiences with hurricanes. I can relate to your stories. For some views of my place in Puerto, before and after. see: www.Seykota.com/Maria . I've been a fan of your trading style since sometime now and admired your success story. I trade actively on the Mumbai Stock Exchange and National Exchange. But im still a lot more inexperienced and that costs me a lot. In fact this email comes to you after making back to back losses since the beginning of august. my capital has become 1/3rd since then. Had a balance of 20000 US$ at the beginning of August and now im below 7000 US$. Im using a website that has stock screener based on a bunch of parameters. But my parameters have been costing me to lose money in Futures since August. Im attaching the screen how it looks. If needed, you can also have my ID and password for the website. Attached is the screenshot. Once again Thanks for the opportunity to connect with you as its definitely huge for me to connect with a legend like you. Take Care and have a great day ahead. You seem to have the notion that market success mostly has to do with parameters. In this case, you can run computer back-test simulations to determine optimal parameter values. To the extent that your own internal programming also plays a role in generating your results, you might consider looking inside yourself for answers. For example, you might consider taking your feelings about <offending others> and <trusting people> and <giving things away> and <your relationship with you daughter> to Tribe as entry points. I want to share my process. A few years ago I write a handful of goals. I achieve some which I feel thankful for. A goal I currently work on is starting a fund and leaving my job. Today I have a big step to take. Secure my first client. Yesterday a woman contacts me regarding my cta business, I gather she gets my information from my recent registration with the NFA. After our conversation I make plans to talk to family, friends, associates. Before speaking with her my plan was to reach out to "strangers", but during our conversation she touched on confidence and an aura that attracts money. I do not feel confident. I think about losing my grandmother, even though I can't consciously remember our time together (I was 6 when she dies), I feel she gives me support and love when she was alive. I do not sense this with my parents. I want so badly for my mother or father to back me and this fund. I just want their support and it hurts that I don't have it but I want it. I also have a feeling of wanting to prove "them" (anyone who has doubted me). I see this playing out in my relationship with markets. I want to prove that I can trade profitably. My current state: I have this cyclical drama where I feel hopeful, I feel loss, then I feel disappointment. The state I want: I make allies with my feelings, my confidence grows and I WIN! What can I do to get to WINNING. Say you have a k-not of memories, feelings and judgments about <wanting support>. Then you likely have your feelings about the matter in non-responsive mode. This, in turn, tends to increase your vulnerability to entrain drama in these areas - and to add additional layers to the k-nots. In Tribe, we employ various methods to spill these k-nots, by celebrating the feelings and by removing the judgments. You might consider taking you feelings about <support> and <disappointment> to Tribe as entry points. I feel insecure and anxious when it comes to my romantic relationships and I am unable to form deep friendships or connections as well. I feel disconnected when it comes to interacting with people. I intend to change that and seek your advise. In TTP, we hold all feelings as precious, as opportunities to share ourselves and as carriers of important information on our emotional indicator panel. You might consider sharing, with your friends and lovers, all your feelings - especially including the ones that currently trouble you. In Tribe, we practice making friends with our feelings - and sharing them with others - including details such as the physical location, shape, texture, flavor, color and so forth. You might consider taking your feelings about <insecure> and <anxious> to Tribe as entry points. I recall once upon a time you noted several constants: Euler's number, Pi, and Easan's lots. I'm happy to report that all these lots on the corner of Seykota Way sold ! Next I'm notifying CERN in case this affects their dark matter calcs. Thank you for sending me the update on these important properties. I notice Google has this street, in Olivehurst, California, variously as Seykota Avenue and Seykota Court. While I feel temptation to own a parcel on my eponymous street, I hesitate to re-engage a taxation-centric relationship with the Left Coast. The London tribe continues to meet once per month. One of our tribe members repeatedly comes back and works on his frustration, he appears stuck on his forms for this. I wonder if he uses TTP medicinally. He seems to work on his frustration until it fades to a bearable level. I ask him how he feels about his frustration not going away, he then displays three different forms. I ask him if he is willing to work on these forms. He does not. Later, after some encouragement, the Tribe gets him to work on these three forms. He stops quite quickly and says that he thinks these forms aren't related to his frustration. I wonder what your thoughts are on the forms that he does not want to experience? I feel sad to see that the momentum behind a Workshop seems to have faded. I would like to learn more from people who are better TTP practitioners than myself. I sometimes wonder if my lack of experience as Tribe leader is holding back the evolution of the Tribe members. Thanks, and I hope that your house and family are all OK in Puerto Rico. In case of a Tribe member who does not move forward, you can simply ask him if he wishes to proceed. Frequent willingness testing separates those who wish to implement the process for personal growth from those who wish to implement the process medicinally, say, by creating a co-dependent relationship with the Process Manager. The process manager drives the taxi; he does not pick the destination - and he does not have any investment in whether or not the passenger decides to get out early. You might consider taking your feelings about <wanting to help people> to Tribe as an entry point. For information on my condo in Puerto Rico, see www.Seykota.com/Maria . Stockcharts mentions you and your assimilation book. I listened to your talk with Michael Covel with great interest. I have been a trader off and on for 30 years. I know all about Forester and systems thinking. I wrote my undergraduate dissertation on system's thinking at UC Berkeley in 1983. After trading for three years I dropped-out and studied meditation and yoga in monasteries all over the world. I think what you and Michael were struggling to say was "Embrace more distance in your mind" and see where it's going. This distance allows you to make the necessary decisions needed at the moment. The Taoists call this wu-wei. Letting the present arise spontaneously. It's a system of feedback. I strongly urge you to do a ten day Vipassana retreat like I did in the 1987. You will dig into deeper layers of your mind and embrace more distance. I have no idea what you mean by Gavilopoly. But all past empires become top-heavy and crashed. I saw this in the USSR in 1978 and saw clearly that's where the US was headed too. Our system had a little bit more flexibility at the time compared to the USSR, but much less now. Trump is just a symptom of accelerated civilizational decay. Too much entropic noise in the digital media system. This noise is clashing with the entropic heat of our industrial system. Double jeopardy and it can't be stopped. Thank for sharing your process and insights. You might consider taking your feelings about <Samatha, Vipassana and Enlightment> to Tribe as entry points. My hardest rule to adhere to is to round file the news as I trade biotech’s with binary events. One idea, sell all positive new driven moves, higher or lower, and apply TF rules. Another is ignore, “news as catalyst” eg. Trend up, stock doubles, sell regardless, or buy more. Perhaps small caps with binary events need another system. I happened to find that you mentioned The Trader's Window is out of print in FAQs on your website. I wonder if you are going to reprint this work in the future? Is the content in this book different from that in The Trading Tribe or Govopoly? I'm curious about what topic would be covered in the book The Trader's Window. The Trader's Window, a novel, follows the deeds and adventures of a trader as he sets out on a path of self discovery and encounters numerous metaphorical situations. I recall swearing off book writing twice, once after writing each of my books. I just wanted to provide some tangible evidence your way -- that TTP has had multi generational benefits. My 3.5 year old who has just started pre school a couple of weeks ago was having some veritable out of character trouble yesterday. Instead of placing the dinner place mats out (her regular job), she would continue to through them on the floor, lay on top of them and mention they were hers only. Other forms of wild behavior were also in play (refusal make eye contact, connect, throwing things in the air, very animated and emotional). Instead of any form of coercion (my experience) or time outs (symbolic abandonment) -- we had a "time in". My wife and I took her up to her room and tried to create a safe place for her to experience her feelings. It took a little while, but she eventually burst into tears -- expressing all kinds of fears and emotions (e.g. fear of mommy leaving, danger at school, being alone, are you leaving me, etc.). I'm really proud of my wife -- she played with her, got her laughing -- all of which got her close to the underlying feelings. This morning is like a new day. The storms have passed (she's experienced her feelings) and she is back to the calm curious little girl we've been with for 3.5 years. Thanks for helping me start this journey. I'm really grateful. I was able to help my daughter. Honestly my kid has been the teacher. For those who are interested -- this site has been really good. I'll forward one of her weekly emails. I really like her as she isn't so much about self promotion (most), as about crediting those whom she has learned from and helping people. Second, this evening I received an email from one of my sponsors who advised me they will have to stop sponsorship of my Trading IQ Game for the reason that they are forming a brokerage and have to remove the term "partner" from all their third party add on vendors website. This was after 6 years of sponsorship. I was just wondering if you would consider donating one or two of your books or perhaps a 1 hour consultation to the winner of my annual contest? Or if you can think of anything else that you could offer as a prize that would inspire a trader to try and win the contest. My other sponsor committed to sponsor me for four more years, and I also offer prizes of my trading systems and indicators. I notice that all the previous winners won by extreme persistence and trying over and over until they become good traders. It is a good trading education tool and generates complex trade reports and suggestions basis of the trading style of each player. I am anticipating that you will decline my request but hoping you might agree. 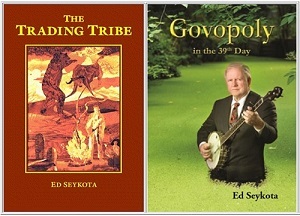 It would increase traffic to your site somewhat as I would link to your site to show who Ed Seykota is if anyone didn't know and thus perhaps add to your book sales. Thank you for the grammar catch. Thank you for extending an invitation to consider participating as a sponsor for your site. 1. FAQ does not endorse people, products, trading systems and so forth. My sponsorship would constitute an implicit endorsement. See Ground Rules, above. You might consider taking your feelings about <getting more traffic to your site> to Tribe. Thank you for all the wonderful work you have done to enhance the lives of other traders and non-traders as well. I recently started to feel very uncomfortable experiencing my feelings of jealousy and sadness during feeling release exercises. I can easily experience shame and anger in feeling release exercises. However, it's so much harder for me to experience sadness and frustration. It seems to persist these feelings with me. I finally decided to write to you. I am so frustrated. Could you please give me some clues? I do not know to which feeling-release exercise you refer. The implicit goal might have to do with getting rid of "bad" feelings. In Tribe meetings, we encourage each other to experience, express, embrace and celebrate our feelings - rather than make them go away. In this way, you might come to know your feelings as allies rather than as enemies - and come to embrace, rather than release, them. You might consider taking your feelings about sadness and frustration> to Tribe.